Last post, I considered the origin of refugee. The word comes from Latin, as we saw, though so many of the actual refugees are fleeing Syria and other Middle Eastern and North African countries to seek asylum in Europe. Here, let’s seek the origin of asylum. Humans should not have to be smuggled like cargo. 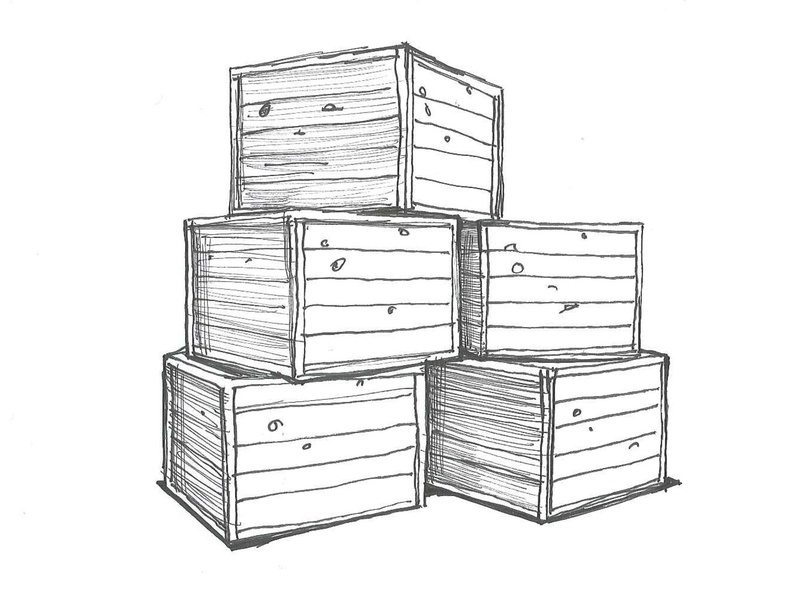 “Cargo crates.” Ink on paper. Doodle by @andrescalo. In my experience, asylum evokes two phrases in the English language: political asylum and insane or lunatic asylum. The latter has largely and duly fallen out of use, but both terms are documented around the middle of the 19th century. The earliest record of asylum in English comes in the form of asyle, attested in the late 1300s in Wycliffe’s Bible. Asylum is recorded by the early 1400s. As the Oxford English Dictionary (OED) defines it, an asylum initially was “a sanctuary or inviolable place of refuge and protection for criminals and debtors, from which they cannot be forcibly removed without sacrilege.” Over the next 200 years, the word became more general in its sense of “refuge.” Now, the word has again narrowed, this time to the political and humanitarian rather than the religious or psychological. For many of today’s refugees, it also comes down to ships – although in a very different manner, of course – as they risk perilous passage across the Mediterranean, hoping for asylum. I look forward to these posts. There aren’t that many linguists around, at least none that I know these days. Wonder if Latin “asīlus” (gad-fly, horse-fly) usually translated as “tabanus” and in Ancient Greek as “οἶστρος” (oîstros) has anything to do etymologically with “asylum”? For one, the Latin ī (“ee”) is different from the Ancient Greek upsilon (“oo”). (I think Modern Greek has shortened the vowel, though?) But the connection seems morphologically dubious to me, as Greek’s “asylum” is composed of “a-” (“not”) and “sylon” (“right to seize”). What sense would connect “refuge” to “horsefly”? A horsefly taking refuge on the beast of burden? I imagine the Latin “asīlus” would have a basic unit of “as-,” perhaps of imitative origin, with the extended “-īl” serving as diminutive? I did look up Latin “asīlus” and it is listed in dictionaries but I couldn’t seem to find any etymology for the word. All they have to say about the matter is that “asīlus” was antiquated even in the time of the stoic philosopher Seneca (4 BC – 65 AD) and had generally fallen out of use and replaced in Latin by “oestrus” ‎(gadfly, sting, frenzy) from the Ancient Greek οἶστρος (oîstros). So faced with the phonetics and morphology of Latin “asīlus” once you compare it to Greek “asylum” as you pointed out, any etymological relationship doesn’t seems to be evident. This along with your refugee post is a very interesting way of providing a different perspective on the immigration crisis. It’s very thought provoking when you put it as simply as the glossary term for the relevant words. I myself have just completed a blog post on perspectives of the immigration crisis in Europe, although in a more tradition fashion. I would be interested to see your viewpoint on what I’ve written, and anyone else who is interested in this subject. Thank you, Lydia! I read through your piece and was impressed with the way you gathered the perspectives. All of these voices clearly demonstrate how complex the matter truly is. Thanks for sharing.